Designed for a contemporary space, the Andover 55-inch W vanity combines clean lines of modern design with classic furniture stylings. The beautiful Carrara marble counter top contrasts the white-finished oak cabinet colour. This vanity is made from an environmentally friendly, zero-emission solid oak hardwood. Andover 55-inch Vanity in White with Marble Vanity Top in Carrara and Mirror Designed for a contemporary space, the Andover 55-inch W vanity combines clean lines of modern design with classic furniture stylings. The beautiful Carrara marble counter top contrasts the white-finished oak cabinet colour. This vanity is made from an environmentally friendly, zero-emission solid oak hardwood. 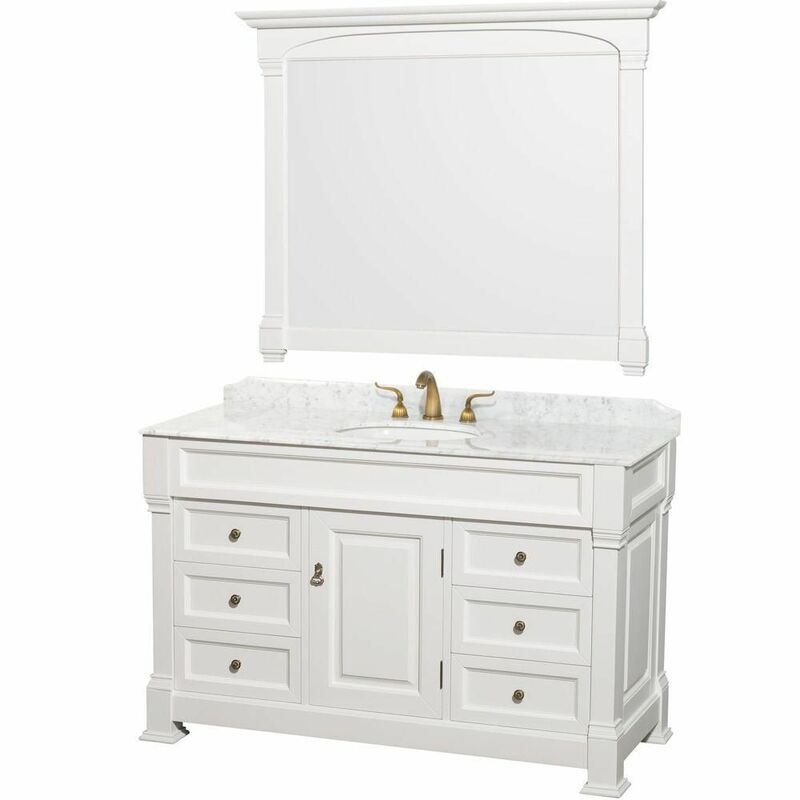 Andover 55-inch Vanity in White with Marble Vanity Top in Carrara and Mirror is rated 4.7 out of 5 by 27. Rated 5 out of 5 by Liz from Beautiful. Looks like a piece of furniture. Much nicer than picture shows. Just wish it had soft ... Beautiful. Looks like a piece of furniture. Much nicer than picture shows. Just wish it had soft close drawers. Rated 5 out of 5 by HomeDepotCustomer from Very good quality!!... Very good quality!! Rated 5 out of 5 by Sharon from I am so pleased with this vanity and mirror. ... I am so pleased with this vanity and mirror. It arrived on time, extremely well packed on a pallet. Being very heavy I hired a professional to bring it in and set it up. It is elegant and beautiful, very well made. Rated 5 out of 5 by Malissa from I love this vanity. Unfortunately I had to return... I love this vanity. Unfortunately I had to return this item because it was 2 inches to large for my bathroom. I ordered the 48" version to replace the 55 inch. Rated 3 out of 5 by Bass from The cabinet vanity is put together very poorly. I had to rework part of the drawers because they ... The cabinet vanity is put together very poorly. I had to rework part of the drawers because they were rubbing the cabinet. Seams had to be recaulked and painted. Poor workmanship. Love the vanity, but do not need the mirror and was considering getting a double sink top. I wonder if only the vanity itself could be bought and at what price.